Welcome to Duke Cancer Institute. To ensure you and your loved ones experience a welcoming, supportive and healing environment, we have designed our cancer centers with you in mind. Our new cancer patient reference guide helps your navigate our cancer center spaces and answers many of the questions you may have about your first few visits, providing information on valet service, re-scheduling an appointment, nearby lodging, clinical trials, education classes, important phone numbers and much more. To download a PDF of the publication, please go to Duke Cancer Patient Resource Guide. 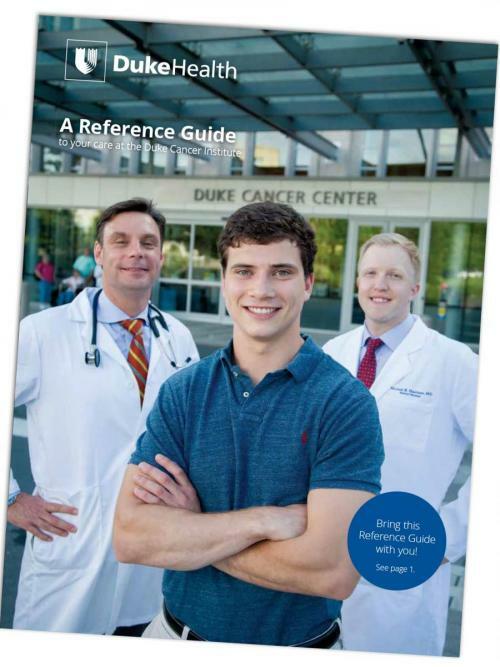 To request a hard copy of the Duke Cancer Patient Resource Guide, please contact Karen E. Butler, Director of Communications, Duke Cancer Institute. When requesting a resource guide, please be sure to include your mailing address.